iGEM is more than a competition. It is a program dedicated to the advancement of synthetic biology. Below are just some of the activities we have participated in that are part of the broader impact. The Long Now Foundation’s Salon Series was held in San Francisco, CA. On February 6, 2018, Megan Palmer, PhD., Director of Human Practices, gave a talk on 'Engineering Biology for Social Scales'. Here she showcased iGEM's work with Human Practices. Learn more about the event by visiting Long Now Foundation’s Salon Series: Engineering Biology for Social Scales. The 2nd OIE (World Organization for Animal Health) Global Conference on Biothreat Reduction, was held in Ottawa, Canada from 31 October to 1 November. Piers Millett, iGEM Director of Safety and Security, will introduce iGEM's Safety and Security program at the event. Showcase iGEM's work to the animal health intergovernmental organization and participants will come from the veterinary sciences, safety and security communities. iGEMers are also invited to present a poster of their work as it relates to human or animal health (infectious diseases) as well as those with interesting safety or security issues. Learn more about the event by visiting 2nd OIE (World Organization for Animal Health) Global Conference on Biothreat Reduction. The Global Community Bio summit at MIT Media Lab was held in Cambridge, MA USA, on Sept 22-24, 2017. Megan Palmer, PhD., Director of Human Practices, spoke about iGEM at the event, it's program and initiatives. Megan is also a Senior Research Scholar at the Center for International Security and Cooperation (CISAC) at Stanford University. Learn more about the event by visiting Global Community Bio summit. The 12th APBA (Asia-Pacific Biosafety Association) Biosafety Conference on Biosecurity & Biosafety – New Challenges of Bio Threat in a Rapidly Changing World of Science & Technology,, will be held in Ho Chi Minh City, Vietnam from 22 August to 25 August. Piers Millett, iGEM Director of Safety and Security, will present iGEM's Safety and Security program at the event. Learn more about the event by visiting Asia-Pacific Biosafety Association. The Center for Global Security Research (CGSR) held an event at the Lawrence Livermore National Laboratory, in Livermore on Aug 1, 2017. Megan Palmer, Director of Human Practices, spoke in the Workshop on Maintaining Innovation and Security in Biotechnology. Megan is also a Senior Research Scholar at the Center for International Security and Cooperation (CISAC) at Stanford University. Learn more about the event by visiting Maintaining Innovation and Security in Biotechnology and Center for Global Security Research. The UNICRI International Biotechnology Network Meeting at the United Nations in Geneva, Switzerland was held on Aug 1, 2017. Megan Palmer, PhD., Director of Human Practices, and spoke about iGEM at the event, it's program and initiatives. Megan is also a Senior Research Scholar at the Center for International Security and Cooperation (CISAC) at Stanford University. Learn more about the event by visiting United Nations Interregional Crime and Justice Research Institute (UNICRI). The Network Science Institute Boston event was held in Boston, MA, USA on July 7, 2017. Megan Palmer, PhD., Director of Human Practices, and spoke eat the iGEMeta Workshop. Megan is also a Senior Research Scholar at the Center for International Security and Cooperation (CISAC) at Stanford University. Learn more about the event by visiting Network Science Institute Boston. iGEM attended the 7th International Meeting on Synthetic Biology, SB7.0, in Singapore. The iGEM Foundation hosted a booth and spoke at the event, and shared the news of its newest programs and initiatives with the attendees. iGEM's impact on the Synthetic Biology industry was on full display, with more than half of the event speaker list comprising of members of the iGEM community. Learn more about the event by visiting 7th International Meeting on Synthetic Biology, SB7.0. The event celebrated the introduction of the 'After iGEM' initiative to the Asia Pacific audience, and featured a networking reception for over 150 leaders in Synthetic Biology, from the iGEM, LEAP and Biosecurity Fellowship communities. iGEM participated in the 'World Showcase' Lighning talk on Tuesday, April 4th. Meagan Lizarazo, iGEM Vice President, joined industry leaders as they presented new initiatives within the field of synthetic biology. 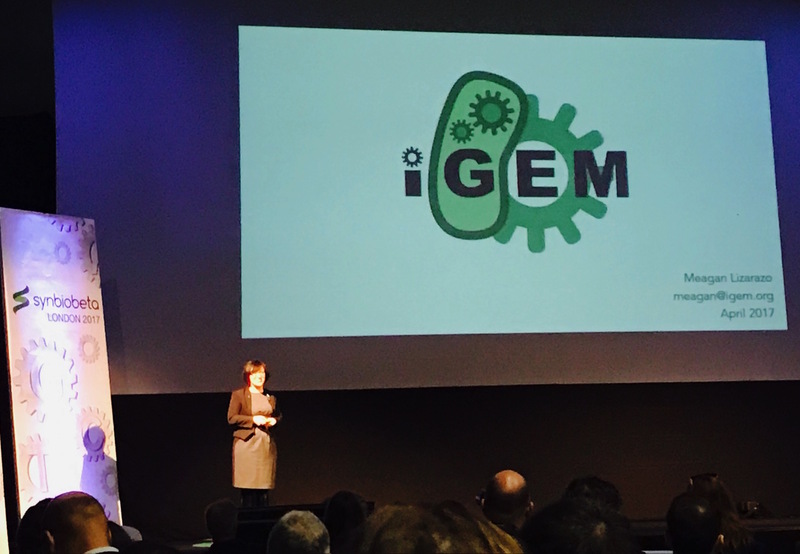 iGEM announced a new program focused on supporting the iGEM community as they move beyond the competition. This new initiative will be supported by multiple community engagement activities - one of which was a reception for iGEMers at the event held on April 5th. Along with speaking at the event, iGEM hosted an exhibitor booth. We thank the many iGEMers who stopped by to say hi and see what's new with iGEM. Learn more about the event by visiting Synbiobeta London and Synbiobeta conferences. 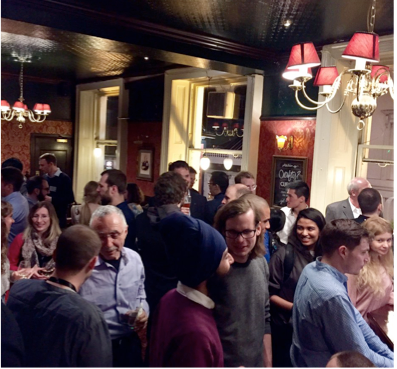 iGEM hosted a reception for all iGEMers present at the SynBioBeta conference in London. Over 50 iGEMers attended the reception, bringing together iGEMers from across EU. The event featured a networking reception that focused on garnering ideas and interest for community building activities that would facilitate iGEMers community engagement after the competition. Please look for announcements on our new programs in the upcoming weeks. iGEM's ground breaking work on safety and security was showcased at SXSW on March 15, 2017. A panel arguing that it was time for a security update for biotechnology saw iGEM's work in this area being highlighted as how to effectively build a security culture and laying the foundations for more sustainable, scalable, security solutions. The panel included current or former iGEM track and committee chairs in software, human practices and safety and security. iGEM hosted its first global strategy meeting in Granada, Spain in February, 2017. Over 20 leading experts in synthetic biology from Europe, North America, and Asia joined iGEM headquarters for this inaugural meeting. With the goal of understanding regional dynamics, all participants were invited to discuss their experiences and views about iGEM and synthetic biology overall. This sharing of local views lead to both a heightened appreciation of the challenges our teams encounter and a greater awareness of situational concerns that iGEM should consider in the future. The meeting also focused on enhancing the iGEM community experience beyond that of the competition and the Giant Jamboree. Attendees brainstormed ideas to further cultivate and harness the ever growing talent that makes up the iGEM community. Look for more details on engagement activities in the upcoming months as we prepare to introduce a new program for 2017 and beyond! iGEM held its first Safety & Security retreat in Granada, Spain in February 2017. Representatives of regional biosafety associations from the Americas, Europe, Africa and the Asia-Pacific region were in attendance. The meeting looked at both emerging issues that could challenge safety and security in synthetic biology and what iGEM might need to do to address them. Efforts at the meeting were expert-led, drawing upon the collective knowledge present to help identify issues iGEM will need to deal with in the shorter-term and those we will need to consider in the years to come. This meeting was the first in a series of planned events on safety and security. Learn more about what was discussed HERE and remember to check out the Safety Hub on the wiki to see what we have been up to.